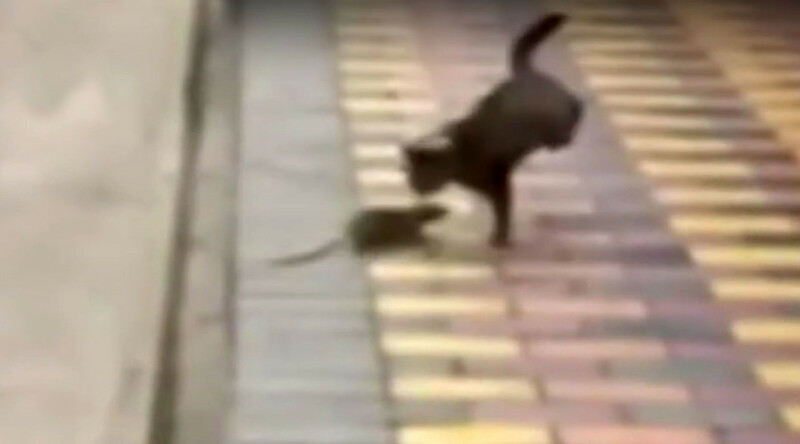 Determined not to be bottom of the food chain, a large rat in the Chinese city of Panzhihua turned the tables on an unsuspecting cat by squaring up and chasing it away. Rats and mice are often top of the menu come dinnertime for hungry kitties. However, it seems in China some rodents fight back. A video of a bizarre animal wrangle, reportedly filmed in Sichuan Province last year, reveals a plucky rat chasing off his feline aggressor. At one point the frightened alley cat is forced into a Matrix style spin to avoid being on the receiving end of the rat’s fangs. Eventually, the cat runs off defeated, with its tail well and truly between its legs.